The availability of water determines where people live and what they do and, reversely, human activities also affect the way water resources are distributed through time and space. The coupled, dynamic and locally specific nature of human-water interactions makes it challenging to attribute causes and effects and generate transferrable understanding from place-based observational studies. Both tasks are essential to inform policy decisions that will have long-lasting impacts on the food, energy, water and ecological systems of tomorrow. 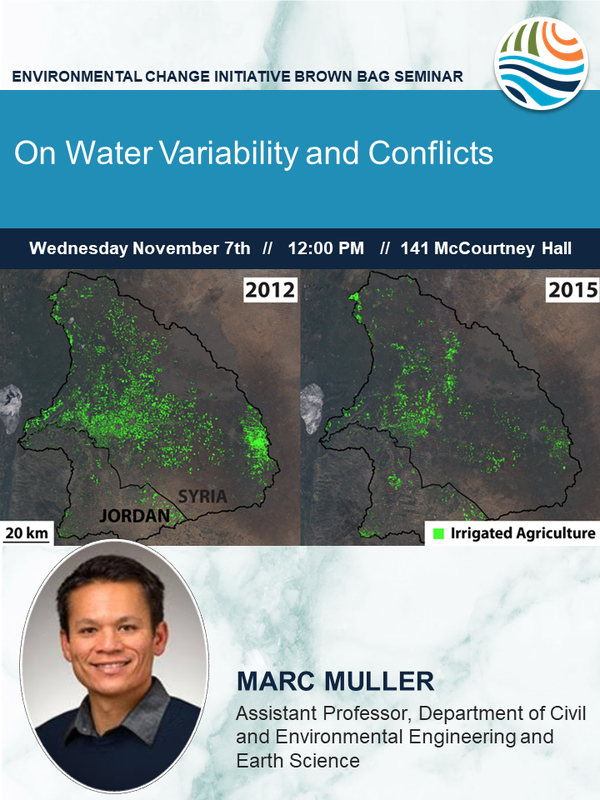 This talk discusses recent progress in addressing these challenges along three important lines of inquiry: (i) the attribution of rapid hydrological change to climate vs. local human action, (ii) the emergence of cooperation over shared water resources and (iii) the interactions between water scarcity and violent conflicts. I will present results from recent investigations on highly strategic water resources in the Middle East and South Asia. Dr Marc Muller is an assistant professor at the University of Notre Dame (Civil and Environmental Engineering and Earth Science) and an affiliated faculty at the Notre Dame Environmental Change Initiative. His research focuses on monitoring and understanding the dynamics of coupled human water systems in rapidly changing and data-scarce regions. Marc did his graduate and postdoctoral work at UC Berkeley and Stanford University with fellowships from the Fulbright program and the Swiss National Science Foundation. He has a MSc (Civil Engineering) and two BSc’s (Civil Engineering and Material Science) from EPFL in Switzerland.